This is a scan of a piece of paper I used to have on my computer desk, about twelve years ago. The quoted words seemed important enough not only to cut and paste but to print out and stick to the desk where they were always visible. The mark from the lump of blu-tack is visible still above the word ‘create’. And create is what I did, as soon as I knew how, on the internet (’Cyberspace’). And employed my Mind to its fullest extent, and all the abilities I had, and all the resources I had. These words of John Perry Barlow’s, written in 1996, were already well-known to many ‘early adopters’ when I found them five years later. But new to me. There were many other memorable quotations on the net that I bookmarked or quoted on my own pages, but this was the only one I printed out. Why – because it inspired me, because it was how I saw the internet and its possibilities. I’d got there a bit later but this summed up what it felt like for me, that we were all contributing to the creation of a new world more ‘humane and fair’. If you think you’re doing that, then you contribute with care and thought, recognise the value of things you find. I had a time of creative enthusiasm, a time of pure making, creating, finding. The first day my first website went online someone else with a website on the same subject emailed me with words of appreciation and encouragement. I wasn’t seen as a competitor but as someone else doing their bit in this new world which was small enough to welcome people into, where new content was flagged up by Yahoo!, which was how she had found me. I really believed in this new world, felt it was amazing that I could write about a day’s ‘garden news’ here in York and that someone in Japan could be looking at it the same evening. Then I made this website, in 2004, based on the same enthusiasm, on the joy of sharing an enthusiasm and a belief in the power and purity of the internet as a free and open space. A proper meritocracy. What mattered was what you made, what you added. People respected that. They didn’t expect to see your face, or even know your proper name. It was normal to have an alias, to have some boundary of privacy and protection, because that enabled us to be free. In real life we may have been judged on our looks, or on our accent, on our social skills or lack of them, on any visible ‘disability’ or difference. Online none of that mattered. We were what we made. And people loved what I made because I put love into it, and tried to make every page and every picture the best it could be. In the intervening years much has changed. I removed the John Perry Barlow quote. The computer desk it was attached to has gone. My last desktop PC blew its capacitors after eight years of service and has been replaced by a laptop and an iPad. Everything else has changed too. That’s the nature of things, and it brings new discoveries with it. But I hoped we might hold on to the ‘fair’ part of John Perry Barlow’s vision, and we haven’t. I hadn’t thought about his words for years, but the recent wrangles over the taking/sharing of website content reminded me of them. He wasn’t talking about the issue of intellectual property specifically, probably because it was taken as a given that everyone linked to everyone else’s work, people got credit for what they’d said and made. That’s how it seemed to me, anyway, arriving online five years later. I woke up yesterday worrying about everything I’ve put online, wondering how much of it had been grabbed from my site and used by others, passed off as their own work perhaps. I wondered about removing it all again. I realised I wouldn’t, but I felt I’d been too ’sharing’, too trusting, to think that what I did so generously and openly would be respected. I’ve known for many years about the problems of content theft, but recently feel overwhelmed and disheartened by the frequency and extent of it. I know from occasional accidental discoveries that photos I’ve taken and text I’ve written is drifting around the web with no record of where it came from. In a way this is rather flattering, and sharing is good, but it’s only good if what is shared remains credited to the person who made it or the web page it came from. Particularly if they made it in the old days of the internet, when content creation and uploading was much more of a palaver than it is now. I see other people’s content lifted from their sites, or photos drifting about on Pinterest, long since set adrift from any link to their original creator. Too many people just grab what they fancy and forget about the maker. ‘I found this on the internet’ used to mean that you linked to it, that was the point. That was good. That’s what the web is, links. The wonderful building block of the net, the humble hyperlink, sending us off on interlinked journeys across the world, across the web, to a wealth of content, some strange corners perhaps. Recently I’ve realised that many people seem to see the web only from the ‘walled garden’ of Facebook. I see no garden, but I can see the walls. And the fact that too many people are making dead ends where there should be links. I ended up yesterday in a small walled place with too many of these dead ends. Postings made from a cut and paste of a whole page of someone else’s text, with no link anywhere in sight. Easy enough to confirm a suspicion of that: it’s a quick and simple thing to select a distinctive phrase from these blocks of text, put it into Google with quotation marks around it, see what Google finds. If it’s a larger organisation, educational charity, museums trust, they might not mind. If the website was made by an individual then they probably do. Particularly if the cut-and-paster then accepts praise and congratulation they’re not entitled to. They didn’t write it, they just copied it. The particularly depressing thing is not just the theft of the content but the number of people who seem unable to recognise the problem or are unwilling to challenge it. Yesterday I saw scores of people on Facebook praising someone who’d posted a lengthy piece on an aspect of local history. The text was an entire page from a website. A link would have been preferable. The praise for this ‘brilliant’ work came even from someone who works for/worked for a large media organisation, who I would have expected would know better. It could be that the person posting had written the page originally, and that it was their website they were copying from. Other similar postings of whole pages from another website suggested not. If I used Facebook, I would ask, but I don’t, so I can’t. When asked about the source, a common response is ‘I found it on Google’. Funny how people refer to Google as if it creates this content. It doesn’t, it’s a search engine. People make the content it finds. Real actual people, working hard, like I have. Most of the valuable online content, the most interesting material, is placed there by people like me with personal websites or blogs. Sharing, in good faith, with the internet community. Who at one time understood what a link meant, and the importance of ‘intellectual property’ (IP) – the words we’ve written, images, films, audio we’ve made. Much of the internet ‘community’ has no concept of those things anymore. In the time I’ve been writing this another person on Facebook has ’shared’ information from this site with no indication as to where it came from. It took a couple of hours of work – research – to compile my page on that building. I see my carefully-created text introduced by “I found this”, cut and pasted into someone’s posting as if they’d written it themselves. We all make mistakes. It isn’t always possible to find out who to credit things to, with older photos for example. There are a few older photos on these pages which I’ve included despite not having the information on who took them. I tried to establish this and couldn’t. But it’s so easy with content already on the internet, which is why everyone should do the right thing, and include links rather than cutting and pasting other people’s work. If you’re on Facebook, or anywhere else online, and notice any of my photos and words unlinked and uncredited, please feel free to reclaim them by suggesting the link to the appropriate page. I have to get some of my words and photos linked back to me. The online world I shared with so freely doesn’t exist anymore. It’s not, in general, ‘humane and fair’. Few people understand or challenge the problem of content theft, which makes me feel less inclined to produce the content. And on my own I can’t challenge content theft or demand respect for creative efforts. It needs everyone to do it. Here’s another old piece of paper I used to have stuck to my desk back then. My late sister, signing off at the end of a letter. Which, as I have felt rather ground down of late, I might stick up again on the wall near my desk. Or to the lid of the laptop. If my sister was here she’d back me up. She’s not, but other kind and supportive people are, and I hope that together we can keep trying for an internet based on being fair. 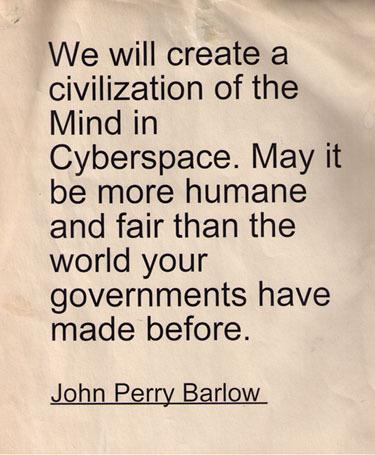 The John Perry Barlow quote is from A Declaration of the Independence of Cyberspace. As you’ll see, the piece was about issues of internet freedom and government control, but I still feel its last paragraph applies to all issues of ‘fairness’ on the web. Food blogging ethics 101. While some of the points are specific to recipes, the wider point is relevant to all of us. Noticed the fact that Chef Dennis has a similar concern as I did in writing the above – seeming to have ‘Delusions of Grandeur’. Most creators feel uncomfortable having to raise this content theft issue, but more of us need to, and more often and more loudly. By Lisa @YorkStories • 6 June 2013 Opinions, thoughts, Web/website matters To link to this page's proper location please use the > permalink. I can’t add anything to this article, other than to offer my support whenever / wherever i see your, and indeed anyone elses, work copied without credit. Very appropriate when applied to thieving would be literata. Sad to see more of your pictures on a certain Facebook page, but at least someone has put a link back to your page. I saw that, and appreciated that someone had added the links. I hope members of the group also realise that the historic images of York at http://www.imagineyork.co.uk (city archives) can only be used on payment of a fee? – http://www.yorkstories.co.uk/blog/2013/06/17/from-the-archives-for-a-fee/ – which may not seem fair, but that is the case.